Taste test: These chips are similar in shape and consistency to Doritos, with a similar salty seasoning. The major difference is that these are a bright shade of green. 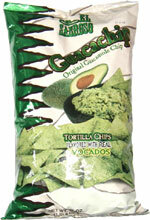 They're good, but they only sort of taste like guacamole. If you eat a whole bunch of them, there might be some avocado taste, but generally the taste isn't a whole lot different from Doritos. Since I like Doritos, I like these too. Smell test: Smells like guacamole. Trivia: Wouldn't dipping a Guacachip in guacamole violate some law of physics? 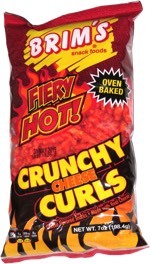 This snack was discovered by Keith and Melissa at B.J. 's Wholesale Club, Auburn, Massachusetts. Review published .